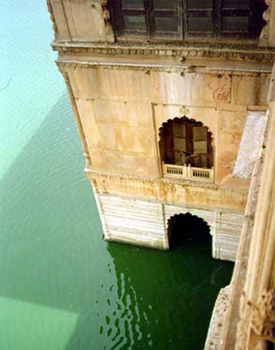 The River Ganges springs forth from snow melt in the Himalayas and runs across northern India until it exits into the sea in Calcutta. 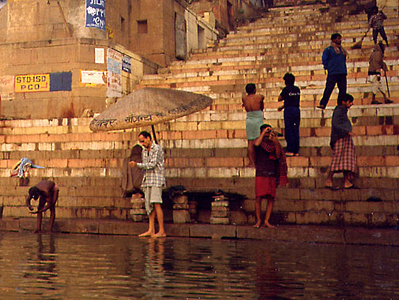 Varanasi (formerly called Benares) is the spiritual center of Pilgrimage for Buddhists. 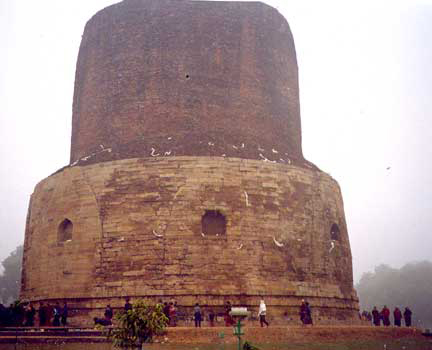 Buddha began his Avatarship in Sarnath ( near to Varanasi) and then spent much of His time here in Varanasi. 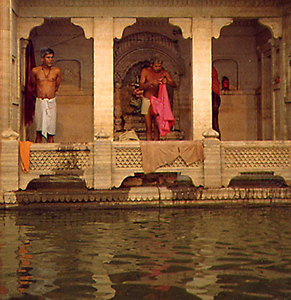 Hindus alike believe that to bathe in the River Ganges is to cleanse ones soul and all try to make the pilgrimage during their lives. 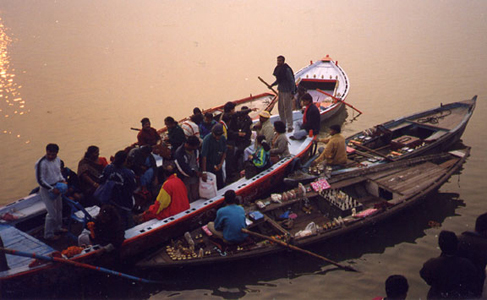 Elderly people come to Varanasi to die and have their bodies cremated and floated away down the River. 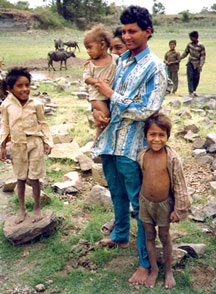 Varnasi is not a tourist place, but many tourists come to see it. 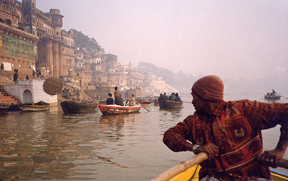 There is a feeling of spirituality that envelopes Varanasi, especially boating on the Ganges at dawn. 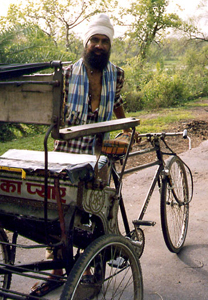 It is an old city with twisted roads and traffic. Cows wander in the streets and alley ways. 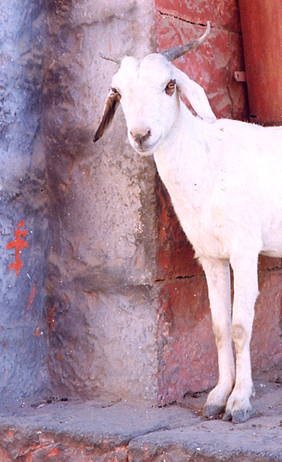 Varanasi is not the new and modern India. 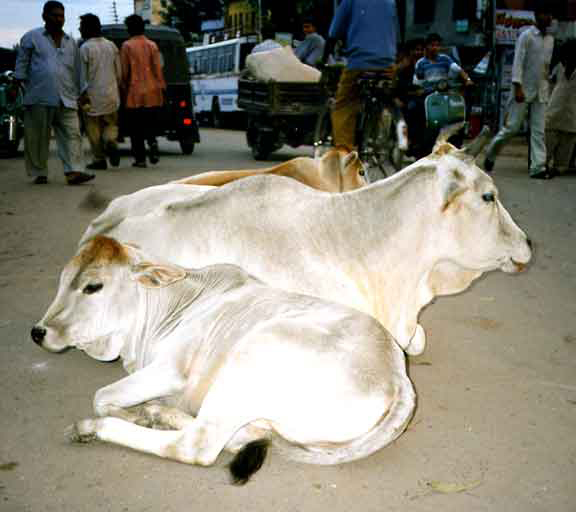 Assorted cows resting in the middle of the streets of Varanasi. An important place during Lord Buddha's teachings. 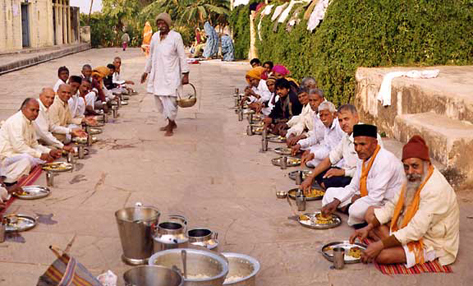 Friendly Jain priest invited us to join them for lunch. 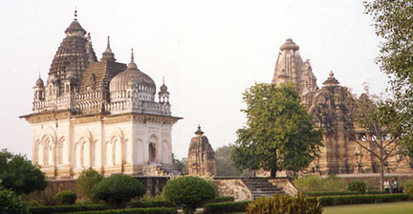 The Jain temple complex was in the same town as Khajurajo Temple . 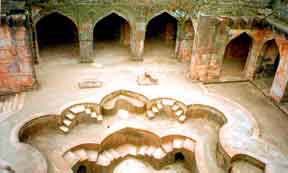 This building is said to have been a harem, with bathing pools & steam baths. 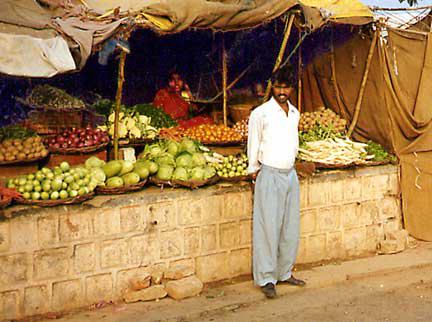 Mandu can only be reached by bus or car from the nearby city of Indore in central India. 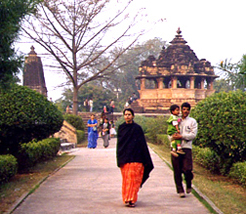 Mandu is a popular 'hill station' with Indians during the monsoon season, when it is cool and the lakes fill up. 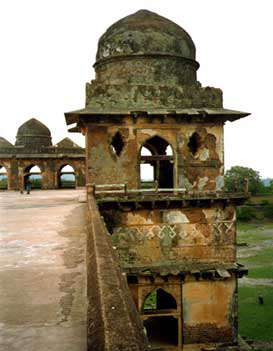 It is a low key tourist destination, not many foreign tourists manage to get to Mandu. The ruins are noted for the wonderful Afghan architecture. 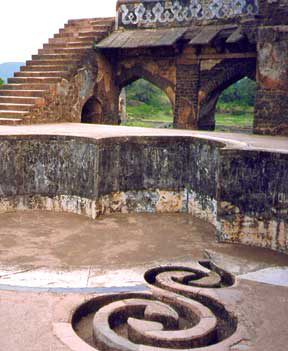 The hill fort was originally built by the Hindus, then captured by the Afghan invaders and rebuilt. 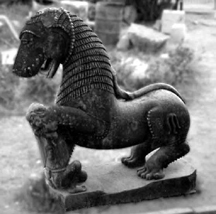 It was later captured by the Moghuls. The original stones were said to have taken a hundred years to be hauled across a great distance, but the Afghans merely took the fort apart and rebuilt with the stones already there. 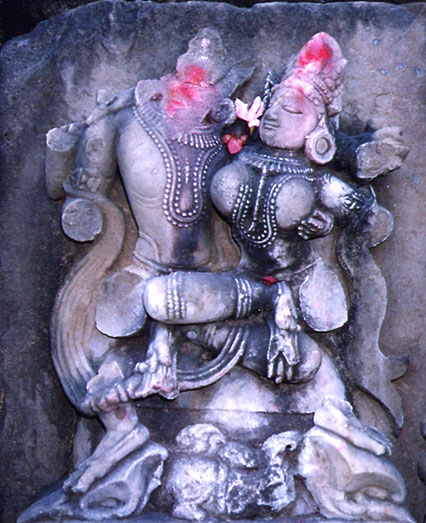 There is a Jain temple in Mandu that is still in use, intricately carved in marble and very lovely. 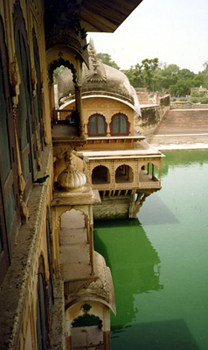 Deeg Palace is a short ride from Bharatpur and from Mathura. 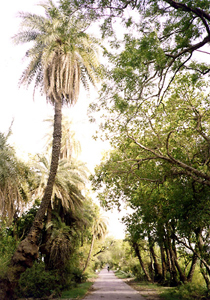 Entering the Bird Sanctuary. 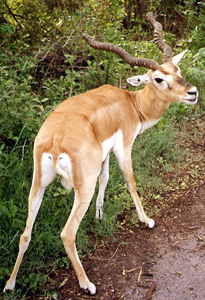 A somewhat tame, but not so friendly, deer. 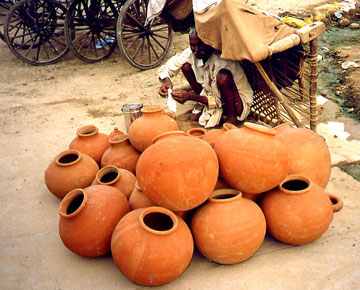 Water vessels at the Bharatpur market place. 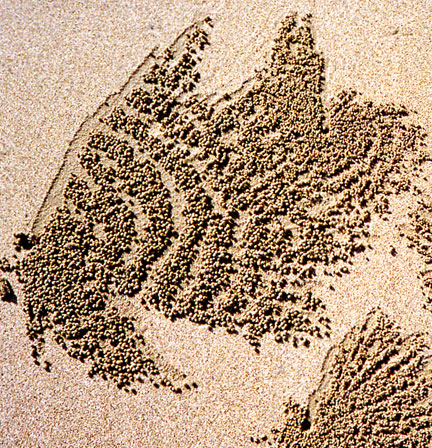 CRAB 'ART' ON THE BEACH IN THE ANDAMON ISLANDS. Considering the huge tides every day, these crabs must redo their fancy housekeeping every day!